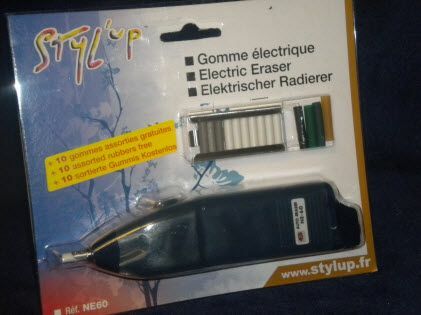 very affective battery powered rotary eraser, great for sketching, pencil or ink erasing PLUS, using the 'ink' tips, they are excellent for 'erase-back' technique during painting onto Shoellerhammer 4G illustration board. ........ as used in Marissa Oosterlee workshops. Eraser £15.99 complete with an assortment of tips. Packs of spare tips available in Soft or Hard......(pencil or ink)......at £4.95 per pack of 10. (no mixed packs).